Bagan was the first capital of the unified empire of Anawratha and was founded in the year 849. It is one of the most important archaeological sites in Asia and has been classified as a World Heritage Site by UNESCO. A walk among its ruins and temples and a panoramic visit from the top of one of them is impressive to appreciate the magnitude of the place. On the banks of the Ayeyarwadi River, an area of ​​42 square kilometers extends completely covered with ruins that form one of the most impressive archaeological sites in the world and that, together with Angkor, in Cambodia, is one of the most important in Indochina. The profusion of ruins testifies to the splendor reached by the ancient Burmese capital between the 11th and 13th centuries. Bagán was founded in 107 AD, succeeding in its reign to 55 monarchs, although its period of greatest splendor does not begin until 1044 with the accession to the throne of Anawrahtaque King, who after conquering Thaton, brought here an endless number of artisans and monks, and 30 elephants loaded with Buddhist scriptures. Two thousand and two hundred stone buildings were built between the 11th and 13th centuries, acquiring during this period a position of great privilege and an immense reputation as a Buddhist center throughout the Asian continent. And, although in 1287 the city was sacked by Kublai Khan’s troops, its remains still reflect its lost grandeur. Only 5000 people today populate the city of Bagán, being completely diluted in the immense field of stupas. Walking among them, climbing up the narrow interior stairs of one of them and contemplating the whole landscape from above is a unique experience. Here, one is alone with history, becomes unique companion of the past, explorer advanced towards the grandeur of exoticism. The absolute silence, the slow descent of the waters of the river, the brilliant sunset on the horizon, create an atmosphere full of magic that reaches its peak when, in the distance, the rain appears timidly and on the stupas is drawn the Rainbow. It is a world without hurry, without cars, without hardly tourists, that faces you to eternity. There are 3 cities that one must distinguish in order to be better oriented during their visit: Nyaung-U, Old Bagan and New Bagan (Myinkaba). Nyaung-U: is the main city of Bagan where the airport and the bus station are located. In Nyaung-U you will find the best hotels and restaurants in the whole area. Old Bagan: it is the place where the most important pagodas and archaeological structures to visit are concentrated. It is the most recommended part to visit. Old Bagan (Old Bagan) is surrounded by an old wall with 3 access gates. The Tharabar gate is the most famous of them all. New Bagan: it is a small town without any type of tourist interest but that offers the best offer of cheap accommodation in all Bagan. It is a main street with hostels, restaurants and cafes shop. Ananda Temple: it is one of the best, biggest, best preserved and most sacred of all the temples in Bagan. In addition, it is one of the few that light up at night. Thatbyinnyu Temple: it is built by two plants in the form of a white box and it is the second tallest in Bagan. For many, one of the most impressive to visit. Dhammayangyi Temple: it is the most immense structure in Bagan and visible from everywhere. It has a pyramid shape and inside there are corridors and corridors full of mystery and legends. Gawdawpalin Temple: 197 meters high, it is one of the largest and most imposing temples in Bagan, although it is not exactly the most inspiring since it has been very modernized in its restoration. Htilominlo Temple: built to honor the goddess of fortune it is a temple that offers more charm if you visit it by taking a walk outside. Sulamani Temple: one of the most attractive and touristic temples of Bagan. With a very sophisticated structure and a perfect internal lighting. Bupaya Temple: located on the shore of the Irrawadi River, it is said that this cylindrical and golden stupa dates back to the III century. Its greatest charm is the location where it is located. 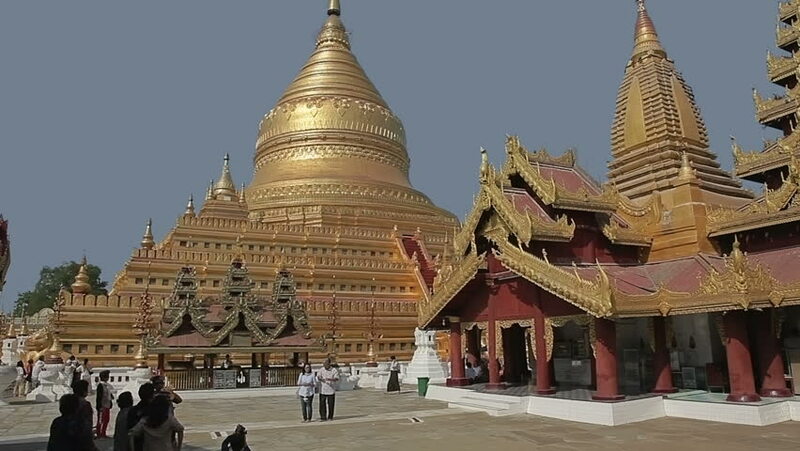 Shwezigon Pagoda: Today this great golden pagoda is the religious center where the vast majority of Burmese people go. Its structure is very similar to the famous Shwedagon Pagoda in Yangon. Royal Palace of Bagan: it may not be an essential visit, but it is part of the archaeological landscape of Bagan. Rent a bicycle: it is one of the best ways to enjoy the Bagan landscape and visit the places of interest. Being a flat area, it is easy to travel from one place to another. Renting a bicycle can cost around 2 or 3 dollars per day. 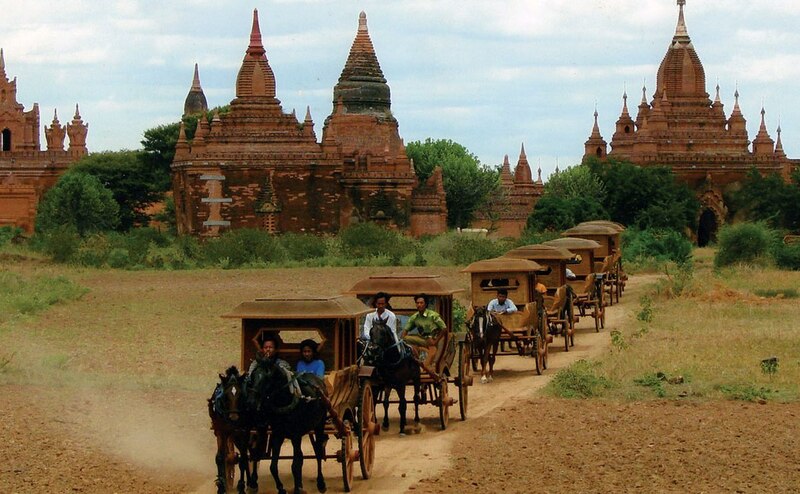 Rent a car to horses: it is also a good transport to move around the Bagan area. It is somewhat more expensive, but can fit 2 people comfortably. Renting a horse cart for a whole day can cost about 20 or 25 dollars depending on what places you want to visit. Electric motorcycle: a means of transport that does not pollute, but is not as economical as the bicycle. Electric bikes can be achieved for well under $ 7. In the street that connects Old Bagan with Nyaung-U, near the Royal Bagan hotel there are two shops that can be used for this price. By car: of course, the least recommended of all for not enjoying both the landscape and access to all corners. It’s a way to go faster and visit more places in a day, however, not so fun and entertaining. Renting a car can cost around 50 or 60 dollars. By boat: Take a boat trip on the Irawady River and watch the sunset. You can hire the service at any local agency or at the same hotel. It can cost about 10 dollars depending on the number of people. 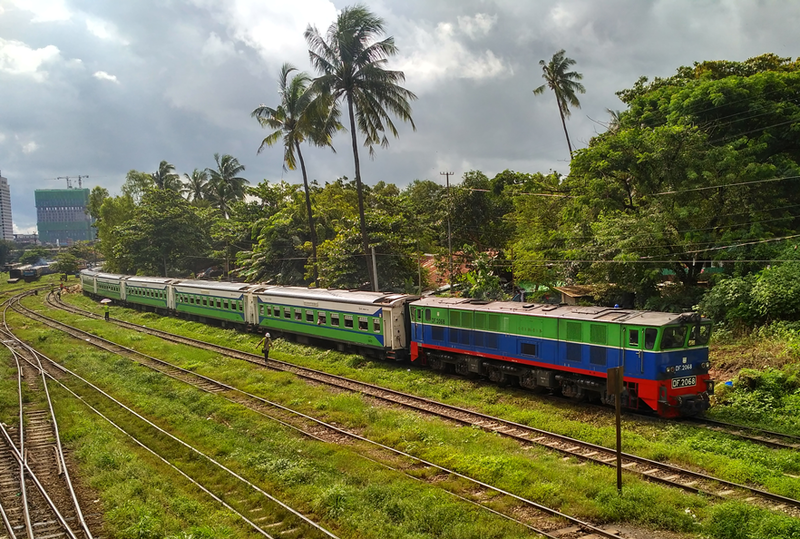 To visit or “enter” the Bagan area it is necessary to pay an entrance that costs 25,000 Kyats or an equivalent of 20 dollars. and is valid for a total of 5 days. Although there are no access points defined and in some temples, it is not necessary to show the ticket, in all the accommodations they will ask you to buy it if you still have it. It is likely that the cost will increase due to the great tourist interest that year after year does not stop. 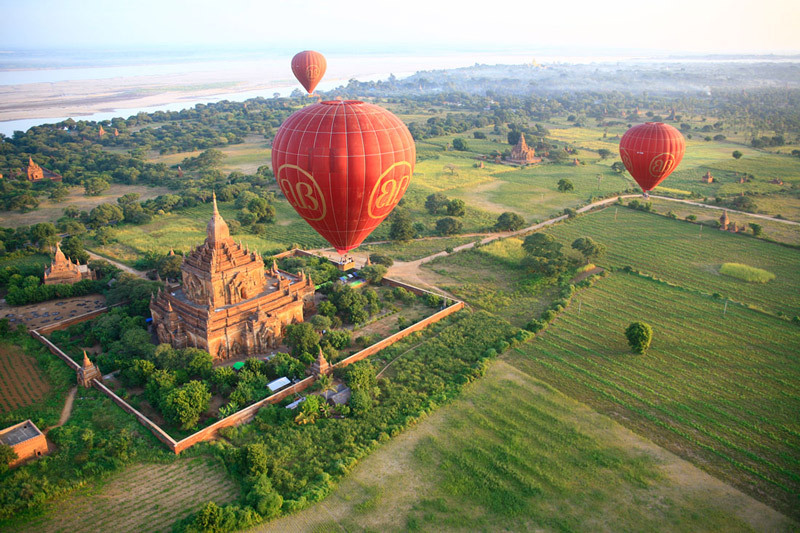 For those who have a higher budget should not miss the experience of flying over a hot air balloon in the Bagan area. During the rainy season (from April to September) the service is not available. The price can exceed 300 dollars per person during 1 hour of flight. 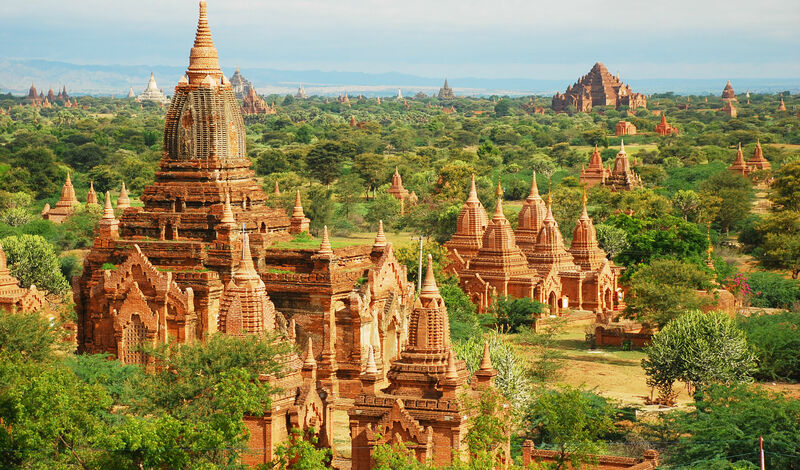 It can be reached in several ways to visit the temples and pagodas of Bagan. Bus: from Yangon there is a night bus for 18,000 Kyats that takes about 13 hours. From Mandalay there are 2 daily buses for 8 or 9 thousand Kyats. In Lake Inle, a daily bus leaves for 10,000 K, 10 hours. Airplane: You can buy a flight with local airlines such as Air Bagan, Asian Wings or Air Mandalay that have good prices (between 40 and 80 dollars the journey depending on the origin). From the airport to Nyaung-U taxi costs 4 or 5 dollars and up to New Bagan approximately 7 dollars. Boat: It can be a good option to take a boat from Mandalay crossing the Irawady River. It is a slow boat with a duration of 13 or 15 hours. They only leave 2 per week, Wednesday and Sunday.